Seems like I've seen some posts on this and some pics. I imagine it's pretty major surgery. Anybody have any info, or done it, or pics? I did a little search and saw pictures of the C4 aluminum hub bracket, now I see what you mean about making room for it. It takes up a lot of room side to side. Thinking back, I do seem to remember some posts several years ago someplace about using the C4 rear suspension on a C3, but the problem was these aluminum hub bracket being so "thick" that it ended up with the wheel mounting surface farther to the outside which of course caused problems. What did you have to do to make room for those C4 hubs? served just going to a much more "cost effective" 6 link setup on my existing C3 rear suspension that after having studied it and seen links on home built 6 links I know I can fab up myself. I am seriously considering a monoleaf for the front, however, but along with a general suspension rebuild from there would likely be my best overall option. I've read about them, incl installs and performance reviews, and see that at least some of the monoleaf front systems result in a lower car. I don't know that I'd want that - for a street and road car it's low enuf as is, and lowering would also seem to make large tires a problem. Would you happen to have any recommendations for any particular front monoleaf setup? Last edited by macx; 01-28-2011 at 06:17 PM.. There are several C-3s (and C-2s) around with complete C-4 rear suspensions, including the batwing. The only issue I have seen is that it is difficult, but not impossible, to get the package mounted high enough in the chassis to get a low ride height. Another option is to use the Greenwood mod. Basically, he cut the front off of the C-3 trailing arm and made provision for the forward links. He then added a pick-up point at the rear of the old trailing arm for the toe link. It is functional, but a little heavy and not as clean looking as the C-4 knuckle. As far as building a new knuckle to accomodate the C-3 bearing set-up, you may want to look at the link below. Stingxray has done that and has plans and cut material available. His set-up also addresses the upper link provision for a six-link. The whole thread is a pretty good summary of where folks are now. I have experimented with adding an upper link to the C-4 knuckle and using C6-style CV joints and outer bearings; but the problem I am currently having is getting enough clearance for the large outboard CV joint with vertical suspension travel. In a perfect world where money was no object, I would put a modified C-4 knuckle configuration in a CAD program and have it CNC machined out of 6061 aluminum. To answer your question about what I had to modify for clearance -- most of what I modded was to get the ride height lower. This meant building a new crossmember that moved the differential higher in the chassis. I relocated the outboard toe links from the top to the bottom of the knuckle mounting point, and I still had to notch the frame above the toe link for vertical clearance. I machined the leaf spring mount off of the C-4 knuckle. I built multi-point forward link brackets welded to the frame rail for anti-squat/anti-dive adjustability and I widened the car to accomodate 345 tires on 18 inch wheels. The Driveshaft Shop built the aluminum half shafts, but C-4 shafts and be shortened slightly for a C-3 application. Ref. your question about the toe link -- treat it exactly like you would a tie rod in the front suspension. The general idea is to have it parallel with the half shaft and equal in length. This is a rough starting point, but you will need to "bumpsteer" the rear suspension, adjusting the length of the toe link and the heights of the inner and outer pick-up points to eliminate any bumpsteer. The stock C-4 suspension has intentionally built in bump steer (roll steer) to "tighten" the car under hard cornering so the idiots don't back the car into an on-ramp wall or into oncoming traffic. 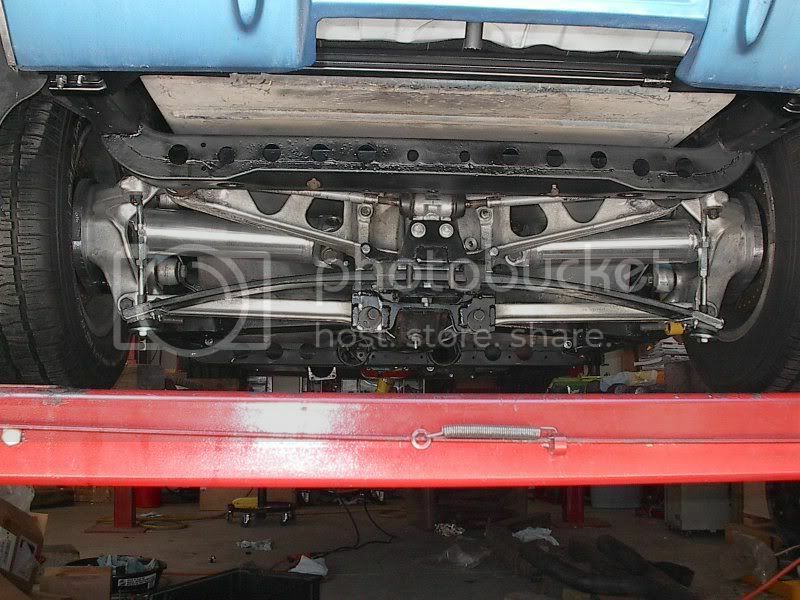 Notice that the C-4 toe links are longer than the half shafts -- this causes toe-in during roll which tightens the car. I missed noticing the significance of the toe rods being longer than the other rods. That is really quite the involved project! Fascinating to the say the least, but way beyond what I need or hope to accomplish on my daily driver strictly street / road car. Some years go I would have gleefully dove into such a project, and on occasion did, but at my age I'm quite a bit less enthusiastic with my driving and the complexity of projects I'm willing to tackle. Besides, with the time it would take to go thru all this, I want to actually have the chance to drive my car for a few years before I have to head for the nursing home! But thanks for all the info. I really enjoy learning "how things work" - one always gleans something out of the learning process that is of value. I'm 63 and have been working on the same car since 1975 -- four different suspensions, massive aero changes requiring a bunch of hand built carbon fiber parts, etc. I work on the car for several hours every day and have for years -- usually in an unairconditioned garage in Phoenix or Las Vegas. I claim its an engineering exercise, but really I think I'm just a glutten for pain. Well, well! I had imagined you were in your 40's or something judging by the complexity of those projects. I've still got a year on you, but unfortunately am going to have to work another 3 or 4 years - the economy was tough on my IRA and I sunk a bundle into helping our daughter start a business, so - - . I've also lowered my sights a lot on mostly the engine for my 81. I'd originally planned a fairly stout 383 but now am down to just doing a top end + cam upgrade on the existing shortblock, which seems to be in good enuf condition to last probly the max of 50k miles before I do take that last trip. I'm still going to go to an improved 200-4R with a 2200 stall, efi on the motor, 331 gears when I rebuild the diff, front monoleaf, and hopefully home brewed rack N pinion & 6 link. Just wanting a nice ride to take some trips out West mostly, revisiting and showing my wife lots of places I've been over the years. I would think I could see all that beautiful scenery much better with the T tops off. Thanks again for sharing all that with me - I'm an old hot rodder but basically new to the Vette rear suspension, and am enjoying learning all the possibilities. Everything will fit. It just takes work. I did mine a bit differently than most, as I kept the C3 (vs C4) trackwidth to retain the stock look with stock wheels. This required narrowing the halfshafts, toe-rods, spring, and batwing. I also used early C4 knuckles as they are appreciably smaller. mfain, next time your up here drop me a line. I'd like to get together with you and pick your brain. I have some very specific ideas for my car and always like to talk to those that have "been there, done that".